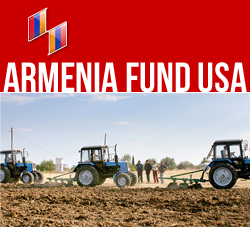 NEW YORK, New York — Armenia Fund has begun construction of a much-needed orphanage in Shushi, with a substantial donation from Armenian-American benefactor Hirair Hovnanian, one of the fund’s longtime and leading supporters. The project is co-financed by the government of Artsakh. Currently there are close to 100 parentless children between the ages of 1 and 15 living in the republic. While 50 of them are housed at the Stepanakert Children’s Home, the rest live with relatives. The planned orphanage in Shushi is designed to accommodate up to 80 children. The future institution will provide a full range of living, leisure, and educational amenities for children of preschool and school age, including bedrooms, playrooms, a canteen, a library with computers, and an events hall. To be equipped with central heating and air-conditioning, the facility will also feature a large playground and tree-lined landscaping. A second construction phase will add a gymnasium, playgrounds for football, basketball, handball and tennis to the complex. Currently crews are clearing the site, in preparation for building the structure. A regular supporter of the fund’s projects since its very inception in 1992, Hovnanian has to date contributed more than U.S. $15 million to the pan-national organization and is righteously an Honorary member of the Hayastan All-Armenian Fund.